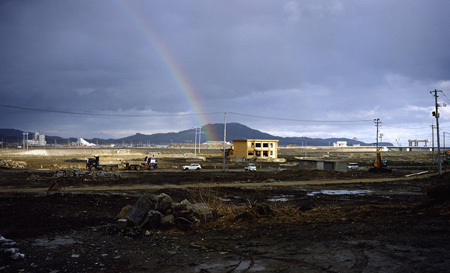 Friday, June 10 at 7:00 p.m.
Japan Society screens the U.S. premiere of Trace the Future, an award-winning documentary that follows Japanese artist Naoya Hatakeyama as he photographs the devastated landscape of his hometown of Rikuzentakata after the earthquake, tsunami, and nuclear disaster of March 11, 2011. Hatakeyama, whois renowned for meticulous photographs that explore the relationship between humankind and nature, represented Japan in the 2001 Venice Biennale and has works currently on display at Japan Society Gallery’s In the Wake exhibition. He suffered enormous losses on 3/11: His family home was washed away in the tsunami and his mother lost her life. Trace the Future delves into the artist’s deeply personal response to the disaster and explores his four-year-long mission of documenting the place of his upbringing. There will a special introduction by film historian Joel Neville Anderson, and the screening will be followed by a Q&A with director Yohei Hatakeyama. To purchase tickets, please visit Japan Society’s website.